Calvert County is committed to using natural controls to reduce reliance on chemicals to manage the mosquito population. We have implemented an aggressive fish management program by stocking mosquito fish in artificial impoundments such as ornamental ponds and storm water ponds. This tiny fish loves to devour mosquito larvae, reducing the numbers of adult mosquitoes. It is native to the Chesapeake Bay and found in tidal areas and streams. It is related to the guppy and is a hardy fish able to tolerate overcrowding and poor water quality. Every year we transfer over a thousand fish within the county. 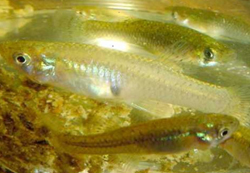 If you reside in Calvert County and are interested in adding mosquito fish to your ornamental pond or know of a storm water pond near your home, you can contact us at 410-535-6924 or by email. The fish are provided free of charge. If you reside outside of our jurisdiction, please contact your local Department of Natural Resources.